LHK | What Does LHK Mean? 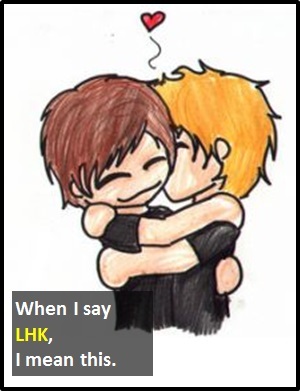 LHK means "Love, Hugs and Kisses". The abbreviation LHK is an affectionate, informal way of signing off a conversation. It would be used between close friends, but never in a business or formal situation. Of note, LHK was also an abbreviation of the Light-house Keepers, an Australian rock band formed in 1981. LHK is usually used as an affectionate postamble to a message. Martin: You're the best friend ever for doing all the driving tonight. Lynette: Your turn next time! See you later. LHK. Saul: I'm so fed up after being dumped again. Rachel: There's someone out there for you so don't give up. I think you're great. LHK. As it is pronounced using its individual letters (i.e., "Ell Aich Kay"), LHK is classified as an initialism abbreviation. Initialisms are different to acronyms, which are spoken like words. Before the digital era, we might have said something like "lots of love" instead of LHK.